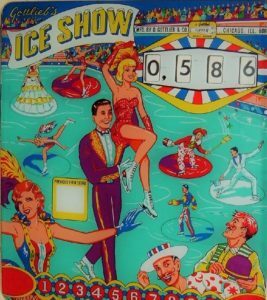 Gottlieb’s Ice Show is a classic 1960’s pinball machine. It features five pop bumpers, numerous targets, and three lanes at the top of the playfield. The white and polished silver elements on the playfield bring out the ice-skating theme. This title had a low production run of only 400 units. As with most of the Gottlieb games from the early to mid 1960’s it features the great, clean artwork of Roy Parker. As the game is played, the lighting behind the glass highlights different characters. The back glass depicts skaters performing an ice show. Ice Show is an add-a-ball game. Each game starts with five balls, but the players have an opportunity to earn extra balls throughout the game. The back glass illuminates the number of balls to play – up to 10. Ice Show is a one-player game suitable for all ages. The game has been configured for free play. Please call or e-mail with any questions. 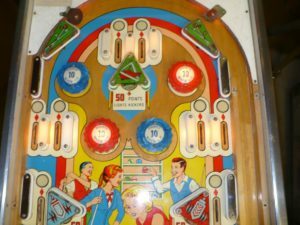 Rack-a-Ball is a classic 1960’s pinball machine. 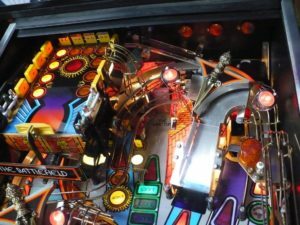 It features 4 pop bumpers, 2 slingshots, 3 standup targets, 5 ball play, 2 bells and a knocker for sound and five lanes at the top of the playfield. The game also features nice animation in the backbox – pool balls rack up in a window as the player completes the numbered targets on the playfield. As with most of the Gottlieb games from the early to mid 1960’s it features the great, clean artwork of Roy Parker. As the game is played, the lighting behind the glass highlights different characters. The back glass depicts characters playing a game of pool. 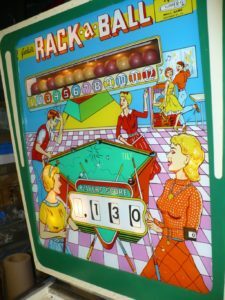 Rack-a-Ball is a one-player game suitable for all ages. The game has been configured for free play. Please call or e-mail with any questions. 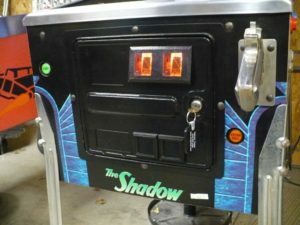 Bally’s Shadow is great game with a number of fancy features and toys. It is a fun and playable game with a nice sound track and various speech clips. 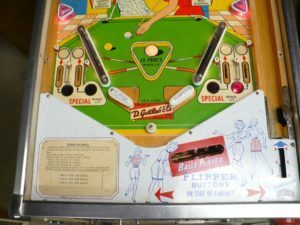 The game features three flippers, numerous wire forms, an upper playfield, and hidden magnets to move the balls through a secret passage behind a “brink wall”. A gun handle on the front of the game is used to fire the ball into play. The “battle field” (upper playfield) is surrounded by targets and has a single bat at the bottom which the player moves left and right with the flipper buttons. The bat automatically strikes at the ball when it reaches the bottom of the battle field. The players also control the ball flow on the wire forms by using a second set of flipper buttons to shift the position of the Punjabi daggers that divert the ball down one or another rail. The game also features a video mode where the player uses the flipper buttons to move the Shadow left and right to dodge daggers thrown at him. The Shadow is a family-friendly, four-player game with multiple shots, modes, and features. The game is setup for free play. 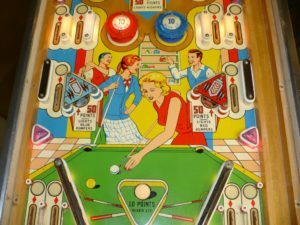 A Family-Themed Pinball Gottlieb’s Ice Show is a classic 1960’s pinball machine. It features five pop bumpers, numerous targets, and three lanes at the top of the playfield. The white and polished silver elements on the playfield bring out the ice-skating theme. This title had a low production run of only 400 units. As with most of the Gottlieb games from the early to mid 1960’s it features the great, clean artwork of Roy Parker. As the game is played, the lighting behind the glass highlights different characters. The back glass depicts skaters performing an ice show. Ice Show is an add-a-ball game. Each game starts with five balls, but the players have an opportunity to earn extra balls throughout the game. The back glass illuminates the number of balls to play – up to 10. Ice Show is a one-player game suitable for all ages. The game has been configured for free play. Please call or e-mail with any questions. 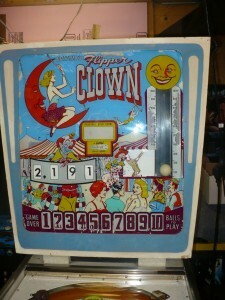 A Family-Themed Pinball Flipper Clown is a classic 1960’s pinball machine. 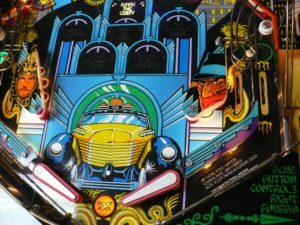 It features three pop bumpers, numerous targets, and a bumper at the top of the playfield that spins the roto-targets. The game features two roto-targets. As with most of the Gottlieb games from the early to mid 1960’s it features the great, clean artwork of Roy Parker. The back glass depicts a carnival with a clown playing a strongman game that has a ball behind the glass that pops up. Flipper Clown is an add-a-ball game. Each game starts with five balls, but the players have an opportunity to earn extra balls throughout the game. The back glass illuminates the number of balls to play – up to 10. Flipper Clown is a one-player game suitable for all ages. The game has been configured for free play. 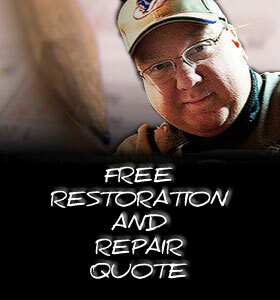 Please call or e-mail with any questions. 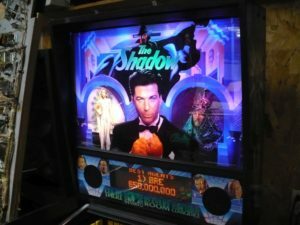 Only The Shadow Knows Bally’s Shadow is great game with a number of fancy features and toys. It is a fun and playable game with a nice sound track and various speech clips. The game features three flippers, numerous wire forms, an upper playfield, and hidden magnets to move the balls through a secret passage behind a “brink wall”. A gun handle on the front of the game is used to fire the ball into play. 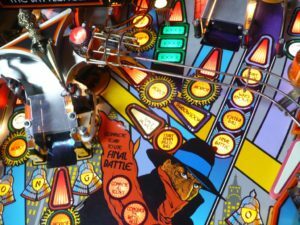 The “battle field” (upper playfield) is surrounded by targets and has a single bat at the bottom which the player moves left and right with the flipper buttons. The bat automatically strikes at the ball when it reaches the bottom of the battle field. The players also control the ball flow on the wire forms by using a second set of flipper buttons to shift the position of the Punjabi daggers that divert the ball down one or another rail. The game also features a video mode where the player uses the flipper buttons to move the Shadow left and right to dodge daggers thrown at him. The Shadow is a family-friendly, four-player game with multiple shots, modes, and features. The game is setup for free play.